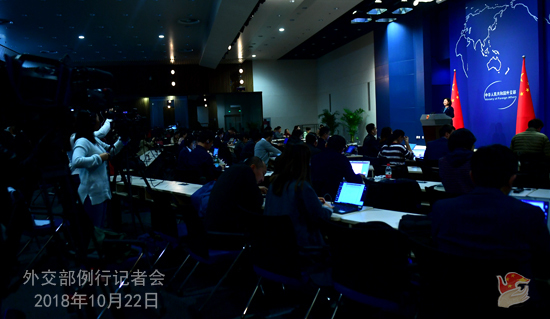 Q: What is China's comment on the 12th Asia-Europe Meeting (ASEM) Summit? A: The 12th ASEM Summit is the first summit after ASEM enters its third decade. Against the backdrop of the fast-changing international situation with many uncertainties, all countries in Asia and Europe have a strong desire to further enhance partnership, jointly address challenges and seek win-win outcomes. Premier Li Keqiang attended the summit and delivered an important speech. The countries in Asia and Europe, which are an important presence in the international political and economic landscape, sent out a clear signal of upholding multilateralism and free trade and opposing unilateralism and protectionism at this summit, which demonstrates their political will to strengthen solidarity and stand together to get through the tough times. On the sidelines of the summit, Premier Li Keqiang met with leaders from France, Germany, the UK, Italy, Greece, the EU, Vietnam and Cambodia and communicated with other leaders present at this summit. Premier Li stressed that we must be steadfast in upholding multilateralism and the rules-based international trading system. We must firmly oppose unilateralism and protectionism. We must adhere to the general direction of openness and development, boost trade and investment liberalization and facilitation and promote interconnected development of Asia and Europe through enhanced connectivity. The leaders from the countries in Asia and Europe highly commend China's viewpoints and propositions. They all believe that in the face of the current complex and ever-changing international situation, the countries in Asia and Europe should step up cooperation, uphold multilateralism and international rules, promote free trade and jointly address such global challenges as climate change, terrorism and cyber security. The chair's statement issued at this summit demonstrates the above-mentioned consensus reached by the leaders. The summit also adopted the report of the task force on Eurasian connectivity, recognized the progress made by the task force in the past two years and identified the priorities, areas and working mechanisms of the cooperation going forward, which will open up broader space for all relevant parties to deepen cooperation and seek greater synergy on the Belt and Road Initiative. As an important member of ASEM, China is willing to work with all relevant parties to follow the principle of mutual respect, equal-footed dialogue and consensus through consultations to elevate ASEM partnership, promote the cooperation on connectivity in a comprehensive way, make the economic globalization more open, inclusive, balanced and beneficial to all, deliver more benefits to the people in Asia and Europe and contribute to the forging of a community with a shared future for mankind. Q: According to reports, on October 18, US Secretary of State Mike Pompeo said in an interview with Panama media that China has invested in ways that have left some countries "worse off". Panama and other countries in Latin America should have their "eyes wide open" when it came to Chinese investment. What is your comment? A: Indeed, we all need to keep our eyes wide open when we want to do something. But it should be keeping eyes wide open and doing things for real, instead of keeping eyes wide open and lying through one's teeth. Interfering in other countries' internal affairs has never been a part of our genes. Attaching political strings to our cooperation with others has never been China's style. The US was trying to drive a wedge by making these accusations. Its pointless efforts underestimated the wisdom and judgment of people in relevant countries and are doomed to fail. President of Panama Juan Carlos Varela, when meeting with State Councilor and Foreign Minister Wang Yi at this year's UN General Assembly, said that Panama is satisfied with the fast development of bilateral ties since the establishment of diplomatic relations between China and Panama more than one year ago. With the concerted efforts of the two sides, bilateral cooperation is producing very positive outcomes. Panama speaks highly of the Belt and Road Initiative which will offer strong impetus for bilateral cooperation and would like to play a positive part in it. I want to reiterate that cooperation between China and Panama and other Latin American countries is for mutual benefit and win-win results. The two sides stand ready to enhance cooperation on the basis of mutual respect, equality and mutual benefit. Our direction and determination are out of question. This will not be disturbed or swayed by some divisive noises. Q: It is reported that President Donald Trump announced that the US will withdraw from the Intermediate-Range Nuclear Forces Treaty. Does China have any comment on it? A: The Intermediate-Range Nuclear Forces Treaty is an important treaty on arms control and disarmament signed by the United States and the former Soviet Union during the Cold War. It has played an important role in easing the international relations, moving forward the nuclear disarmament process and safeguarding global strategic balance and stability. It is still highly relevant today. Unilaterally withdrawing from the treaty will cause many negative effects. What needs to be stressed is that making an issue out of China on withdrawing from the treaty is totally wrong. We hope that the relevant country can cherish the hard-won outcomes achieved over the years, prudently and properly handle the issues related to the treaty through dialogue and consultation and think twice before pulling out. Q: Is there any concern on China's part that the US will use the withdrawal from this treaty as a way to target China with more land-based cruise and ballistic missiles? A: Just now I have made clear China's position on this issue. Unilaterally withdrawing from the treaty will cause many negative effects. The US side should prudently handle the issues related to the treaty. It is even more wrong to make an issue out of China on withdrawing from the treaty. We hope that the US side can shoulder its responsibility and think twice before its pullout. Q: There have been reports that the barrier lake caused by the landslide in Yarlung Tsangpo has aroused the concern of India. The Indian side said that it is in touch with China on this issue. What is the latest situation? A: China has been in close contact with India on the threat posed by the barrier lake caused by the landslide in Yarlung Tsangpo. After that happened, the Chinese departments for water resources immediately notified the Indian side of the relevant situation, activated the emergency information reporting mechanism and warned the Indian side to get prepared to deal with it. Starting from October 17, the Chinese side offered the temporary hydrological data on an hourly basis to the Indian side. As of October 22, we have provided seven bits of hydrological information and 110 bits of hydrological data to India. 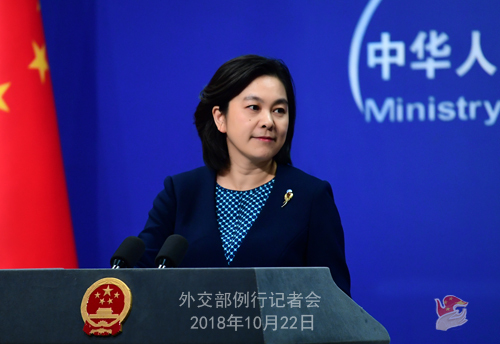 On October 19, China emergently notified the Indian side of the situation regarding the natural flow of the barrier lake. According to Chinese competent authorities, as of 12 o'clock, October 20, the section of Yarlung Tsangpo where the barrier lake is located has basically resumed normal natural flow and the Mo Tuo part in the lower reaches has also basically come back to normal. The Chinese side is still closely monitoring the landslide and will maintain communication and cooperation with the Indian side through the existing channels. Q: China and ASEAN are holding the first military exercises in the South China Sea. Do you have more details on that? A: The Chinese military has released the relevant information on what you just asked. China and ASEAN countries are holding exchange activities and live drills in Zhanjiang, Guangdong and the waters and airspace to the east of it. The drill is the first joint maritime exercise between the Chinese army and armies from ten ASEAN countries. It showcases the confidence and determination of China and ASEAN countries to maintain regional peace and stability. It is also an important operation to implement consensus reached between Chinese and ASEAN defense ministers and deepen defense and security cooperation and mutual trust between China and ASEAN. We believe that it will help enhance maritime security cooperation between China and ASEAN to increase the collective ability to counter security threats. Q: Reports say that the UBS has asked some of its staff to reconsider visiting China because one of its female bankers has been blocked from exiting China. I wonder if you could offer details on who that banker is? Which nationality is she? What's the reason for her not being allowed to leave? A: I am not aware of the situation mentioned by you. I would refer you to the UBS. Q: In a recent joint statement, the Office of the Director of National Intelligence, Justice Department, FBI and Department of Homeland Security said that Russia, China, Iran and other foreign actors are trying to interfere in the next month's midterm elections. Meanwhile, we saw reports from Bloomburg that analysts from many US cyber security firms said that they found no evidence supporting that China is interfering in the November midterm elections. What is your comment? A: We have noted relevant reports. China has stressed its stern position on it many times. I would like to reiterate that such accusations are made out of thin air and the Chinese side firmly opposes that. China upholds the principle of non-interference in other countries' internal affairs and we have not the slightest interest to interfere in the US election. The international community has already known fairly well who wantonly interferes in others' internal affairs. On this issue, we hold nothing back and have a clear conscience. In fact, we have noticed that many US media and people from different sectors believed that accusing China of meddling in the US election is unbelievable and ridiculous. 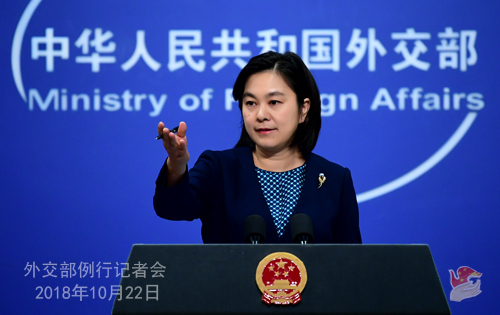 We urge the US to stop making groundless accusations and slanders against China and take concrete actions to ensure the sound and steady development of China-US ties. Q: The Japanese table tennis player Ai Fukuhara yesterday announced her retirement. She had lived in China for a long time. Some people think that she has contributed to China-Japan friendship. What is China's comment on her retirement? A: Ai Fukuhara is a table tennis player who is very popular with the Japanese people. Many Chinese people also like her. She is very lovely and her performance in table tennis is outstanding. We hope that more people from China and Japan can devote themselves to China-Japan friendship and contribute to the friendly exchanges and cooperation between our two countries. Q: The visit of Japanese Prime Minister Shinzo Abe is coming up on Thursday, a quite historic visit. Does China think this visit may go better than originally expected because both China and Japan have their own problems with the United States? Is the US bringing the two sides together a little bit more closer than it might otherwise have been? A: The United States is certainly a very important country. However, it does not mean that all countries, when conducting exchanges and developing relations with each other, should only take the United States into account. China and Japan are each other's important neighbors. Maintaining exchanges and friendly cooperation across the board serves the common interests and meets the shared aspirations of our two sides. This year marks the 40th anniversary of the signing of the China-Japan Treaty of Peace and Friendship. As agreed by our two sides, Prime Minister Shinzo Abe will pay an official visit to China. During the visit, Chinese leaders will hold meetings and talks with Prime Minister Shinzo Abe to exchange views on the improvement and development of China-Japan relations and international and regional issues of mutual interest. Our two sides will also host a reception commemorating the 40th anniversary of the inking of the China-Japan Treaty of Peace and Friendship and the First China-Japan Third-Market Cooperation Forum. We believe that Prime Minister Shinzo Abe's visit will help the two countries strengthen political mutual trust, deepen practical exchanges and cooperation across the board, enhance cultural and people-to-people exchanges and make China-Japan ties continue to grow after our bilateral relations came back to the right track.